For the news magazine, see Time magazine. 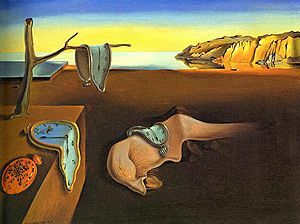 Time is an abstract concept of measuring the sequence of events within the universe. Christianity introduced the concept of eternity, whereby time has no meaning and either stops or does not exist. Evil tends to focus on brief periods of time, as in 9/11, while good tends to last longer, as in the Resurrection. Sin is often based on the past, as in pride and jealousy, while good is often based on the future, as in faith and love. Economics makes an effort to place values on time, and to compare the value of the future to the present. The Bible has 599 references to "time", roughly evenly distributed in the Old Testament and New Testament. Time is the subject of several of the most enigmatic parables, such as the parable of the vineyard workers. The workers measured their value and expectation for compensation in terms of time, but the master compensates the workers independent of time. The parable teaches the power of God to forgive the person who repents late in life as easily as the person who finds God as a young man. But the parable also provides insight on the timelessness of God in contrast with the time-obsessed nature of man. Time provides a basis for people to frame their outlook on their own lives, dividing it, for example, into the past, present and future. But the Bible suggests a possibly different reality, as in Jesus's observation that "the last will be first, and the first will be last." The "arrow of time" in physics describes how disorder in nature increases with time, which is an asymmetric or directional aspect of time. This suggests a connection between time and entropy. Space lacks this type of asymmetry. Assumptions about time underlie the Theory of Relativity. That theory characterizes time as an additional dimension beyond space. It suggests than time can pass at different rates in different frames of reference. Under relativity, it therefore makes no sense to talk about twoevents being simultaneous, as they may be to one observer but not to another. In legal proceedings, court rules specify how time is calculated for determining deadlines. The Federal Rules of Civil Procedure, for example, has a separate Rule 6 entitled "Time". As of 2008 it specifies that holidays and weekends are included in calculating time periods for deadlines unless the period "prescribed or allowed is less than 11 days." When the deadline falls on a weekend or holiday or day in which the office of the clerk is inaccessible due to "weather or other conditions," then the deadline is the next day not aforementioned. Time is sometimes drawn or personified as Old Father Time, an old man with a long beard and a sickle. Death likwise is personified as a man with a sickle. These two men-with-a-sickle seem to be one and the same man, prompting some to ask "Why, if God is both good and omnipotent, would He make it to be that diseases and death are the consequences of certain acts?" The answer is that a wise and capable leader is such that not only does he get material satisfaction for all his efforts to make his domain to flourish, he actively discourages any would-be tyrants from achieving a paradigm which is less than---i.e., 'alternate' to---a flourishing one. In other words, no kingdom flourishes but that which flourishes. So, pain, dysfunction, and death are active measures which God uses to discourage any acts that are contrary to the human role of making the Creation to flourish. Humans themselves even wish for such a Creation; But, in their fallen state, humans do not so constantly wish to abide a way of life which functions toward that end; In fact, fallen humans sometimes purposely cause needless pain and dysfunction to other creatures, including to other humans, in a selfish effort to obtain personal triage for things which only an unfallen Creation can unfailingly provide. Only within the unrealistic Libertarian ideal is a person truly free to take any action which is not already (commonly) known to be macrologically damaging to any presently or futurely living person. So, the Libertarian ideal fails to account for its own premise of general goodness. This means that the Libertarian ideal fails to admit to itself that the world is not made for unrighteousness at all, but was made for an original state of natural harmony in which the inescapably inter-open state of reality is the only state conducive to a flourishing of human efforts to recreate an Edenic way of life across the globe. So, time is a valuable resource, and each person has the responsibility not to squander the gift of time by engaging in unproductive activities such as watching television, senseless bickering or frequenting worthless websites on the internet, and instead to use their time industriously for the betterment of society and the greater glory of God. Conservative values can be a helpful aid to achieving this objective. ↑ Matt. 20:16 (spoken in the context of time). This page was last modified on 4 December 2017, at 15:40. This page has been accessed 16,054 times.